We recently made a trip back to Kansas to visit family and friends and during our stay I got to hang out with my pal, Laura, who is my kindred spirit who also eats gluten-free, is super into baking, and even crafted this fine Gluten Free Pizza Crust Recipe. Isn’t she a gem? We were passing through a health food store, checking out their wares, when I spotted a Hail Merry almond butter tart on the top shelf. The tart and I locked eyes, and I immediately knew its destiny: my stomach. So I snatched one up and we promptly devoured it. This is my inspired version. This recipe is simple, requiring just 9 basic ingredients and 20 minutes to make! The chocolate date-nut crust is adapted from my No-Bake Chocolate Cheesecakes. The filling is just almond butter mixed with a little sea salt and maple syrup. And the top layer is a simplified version of my 2-ingredient Dark Chocolate Truffles! The reason I love these bars so much – besides the fact that they come together in 20 minutes – is the salty-sweet combo. My favorite desserts have always struck a balance between salty and sweet (which explains my obsession with Snickers), and this recipe is no different. 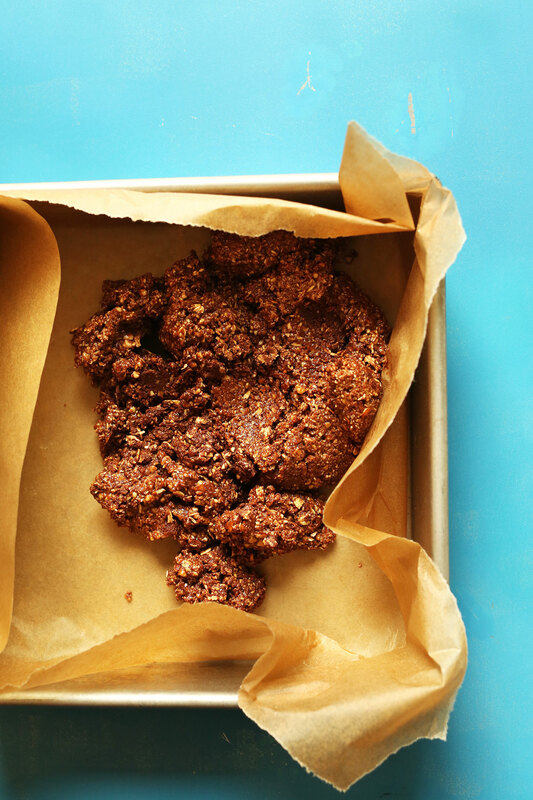 Plus, they’re naturally sweetened (aside from the dark chocolate ganache), and chock-full of protein and fiber thanks to the nuts and almond butter. Serious love for these gems. 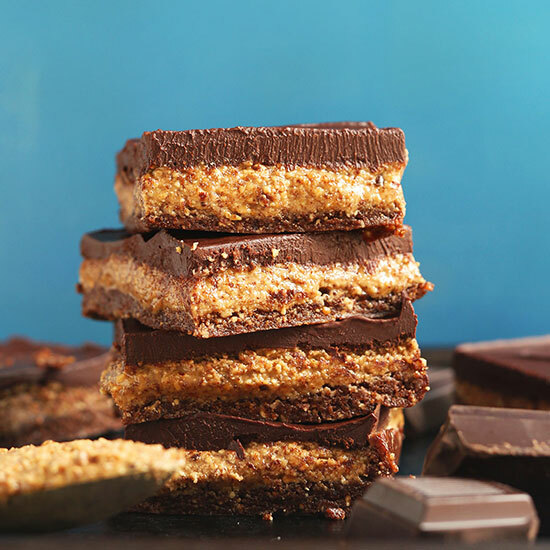 These would make the perfect bars to have on hand during the week when you’re craving something sweet but not overly indulgent. They’re also great for entertaining, as they’re sure to please a crowd. If you try this recipe, you have to let us know! We love your comments, ratings, and – as always – your photos tagged #minimalistbaker on Instagram. Cheers, friends! 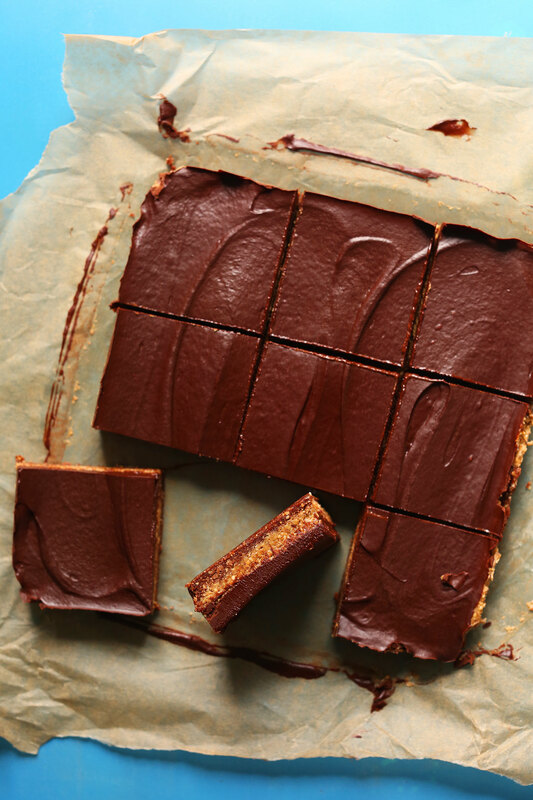 Fudgy, rich, No-Bake Almond Butter Cup Bars in just 20 minutes! Salty-sweet date-nut crust, gooey almond butter center, and ganache topping! Prepare crust by adding nuts, cocoa powder, and sea salt to a food processor and blending into a meal. Remove from bowl and set aside. Add dates to the food processor and mix/pulse until small bits remain or a ball forms. Break up the dates with a spoon so they're not all in one clump. Then add the nut-cocoa mixture back in and blend to combine until a loose dough is formed. Transfer the dough to a parchment-lined 8x8-inch baking dish (adjust number/size of pan if altering batch size) and spread with fingers to evenly distribute. Then top with parchment paper or plastic wrap and use a flat-bottomed object - such as a drinking glass or measuring cup - to press and pack the crust into a solid, even layer. Remove parchment paper and set aside. Add the almond butter mixture to the crust in spoonfuls. Then top with parchment paper again and use the same object from earlier to spread and pack the mixture down into a flat, uniform layer. Remove parchment paper and set in freezer to chill. 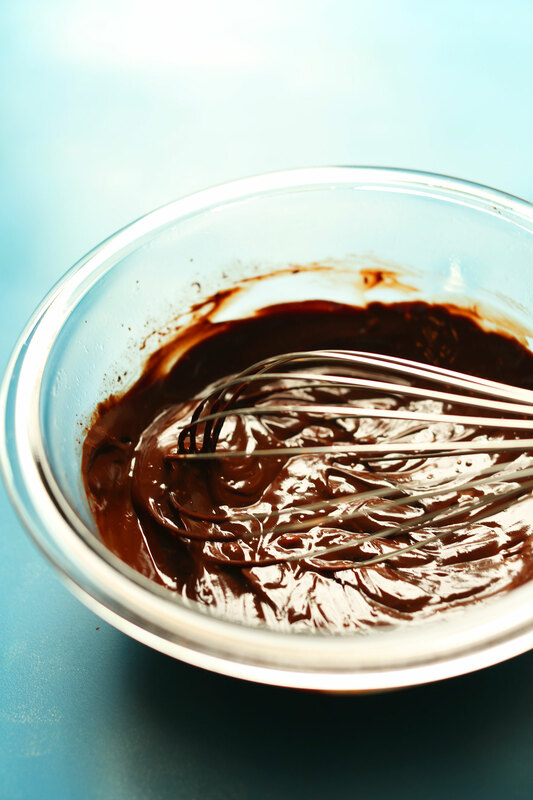 Add finely chopped dark chocolate to a medium mixing bowl. Add coconut milk and coconut oil to a separate glass mixing bowl or glass measuring cup and microwave until hot but not boiling (alternatively, heat in a saucepan on the stovetop until very hot). Pour the coconut milk directly over the chocolate, stir to combine, and cover with something (such as plastic wrap) to encourage it to melt. Let set for 5 minutes. Then whisk to combine. The mixture should be entirely melted and smooth. If not, heat in the microwave in 20-30 second increments until entirely smooth and no chunks remain. (Alternatively, set your glass or ceramic mixing bowl over a double boiler on the stovetop to melt). Remove 8x8-inch pan from the freezer and pour the ganache on top. Spread with a spoon until smooth. Then add back to the freezer to set for 5-10 minutes, or until semi-firm to the touch (enough to slice). Slice into desired number of bars: 9-12 (amount as original recipe is written // adjust if altering batch size) or even smaller so they're "bites" rather than "bars." Enjoy immediately. Store leftovers covered in the refrigerator up to 1 week or in the freezer up to 1 month. I had to leave a review for these. Made for a work gathering to accommodate a colleague who is dairy and gluten free and EVERYONE raved about them! I had to give the recipe out all day. A few modifications…I roasted my own almonds, added a tablespoon of solid coconut oil to the nut/date mixture to help it come together and a bit more maple syrup to the peanut butter. I also used coconut cream diluted with a bit of water and the coconut oil for the ganache. This recipe was great, thank you! I was looking for something similar to Hail Merry chocolate cups. This recipe is a little too much almond butter for my liking but it still turned out great. Next time I will make more crust and use less almond butter. I used Lilly’s Family Foods pitted dates which were soft and moist, crust not dry at all like other comments have mentioned. Delicious but definitely had to go the bite-sized route because these babies are RICH! I cut mine into 40 pieces. I can’t imagine eating 1/12th of this recipe in one sitting. But that’s just me! LOL. My husband feels differently. The consistency of the ganache is excellent. I used vegan dark chocolate morsels by Enjoy Life. I have yet to be less than totally impressed by one of your recipes! Thank you!!! This is glorious. Another insanely delicious recipe, thank you! Whenever I make a date crust, I give them a quick nuke with maybe a T of water to soften the dry fibers, and fork smash it before putting it into the food processor. Worked well again. Was making it for a friend, so used peanut butter as requested, the salted no-stir kind and it went on smoothly with a spatula. The top is melt-in-your-mouth gorgeousness and my favorite part by far. I made this recipe after reading all the reviews of people having difficulty with the crust crumbing, so I made sure to add more dates and to make sure it felt doughy between my fingers before pressing it into the pan. However, I still had the same problem with the crust being crumbly. I tried to cut it into bars after leaving the dish in the freezer for ~30-45 minutes. All the crust just fell apart so I ended up just putting the uncut bars back into the pan to deal with another time. I came home this evening–now they’ve been in the freezer for ~24 hours–and was able to cut them into bars with minimal crust crumble. I still lost some crust, but not nearly as much as before. The bars are delicious, so hopefully this trick will help someone else! I also made the 2-Layer No Bake Peanut Butter Brownie bars about 2 weeks ago and had no trouble cutting those after being in the freezer for 15-20 minutes. Next time I make these almond butter bars, I may try using the crust recipe from the peanut butter brown bar recipe, as that crust held together quite well. Just a thought! I just made these. I used Silk Coconut beverage because I didn’t have light coconut milk. Turned out fantastic! Canada thanks you! 2. You can use any type of nut you want in the base. I’ve made the recipe a few times to use up any I have left in the pantry. I especially like walnuts. 3. Peanut butter, tahini, hazelnut nut butter… anything works for the middle layer! 4. Cut them into tiny squares because they’re very rich and calorie dense. 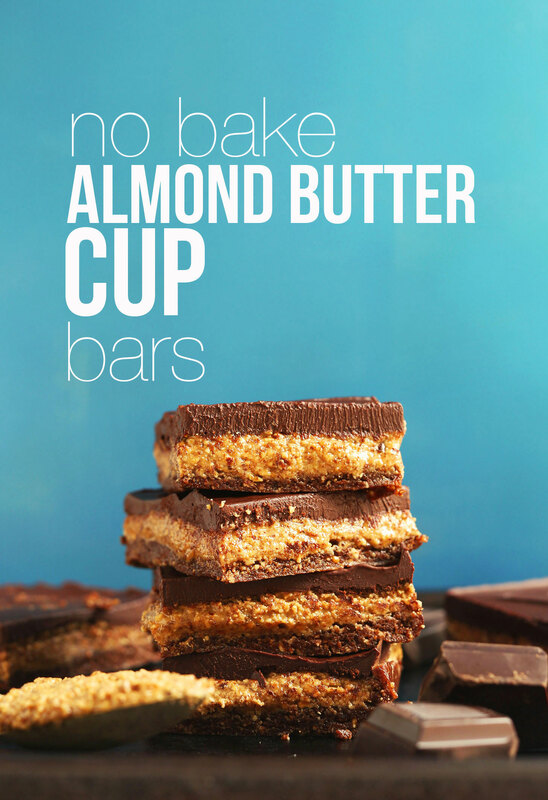 When I altered my famous peanut butter bars, the result were these tasty no bake almond butter bars. Carbless Pancakes Quest Skinny Pancakes if you are a carb counter here is a little break down of how skinny these really are. These are so good! Would you suggest adding more dates if the crust doesn’t stick together? Or maybe using dates that are warm instead of directly from the fridge? Thank you! I make your recipes for dinner every week! So healthy and delicious! Seriously! These bars are delectable! The perfect combo of salty and sweet. No guilt here! These will be a popular addition to our gatherings with friends & family. This is our 3rd recipe in 24 hours. We love y’all! My almond butter mixture completely stuck to my parchment paper pulling up some of the base layer too. I tried a spatula and even a coconut oil coated meauring cup that I was using the evenly press down the date/nuts dough. I used 365 Creamy Almond Butter and 365 Parchment paper. Any tips? All the ingredients taste fantastic but aesthetically I like md for my bars to be more ‘presentable’. These sound soooooo good. ? I’m definitely going to make them. May I just clarify if the coconut milk is the type kept in the fridge as a dairy milk alternative, or the kind in a can full of fats and oils? I never know. Hi Annie! 99% of the time I’m referring to the canned coconut milk (use light for less fat). I absolutely love this recipe! It’s super simple to make and it’s hard to go wrong with almonds and chocolate. I went to HyVee and used their grinder to get fresh almond butter and it turned out perfectly. They also fill you up quite well so I was able to limit myself to one pretty easily. Just made this today and used the roasted almond option. These are delicious. I may have to hide them in my freezer. I crave peanut butter cups every so often, and these will hit the spot perfectly! Thank you for the recipe! Made these tonight. I don’t have a food processor so I tried to use a blender – the blender wasn’t happy with the date goo/nut mixture. I thought I killed my Vitamix but after it cooled off a little, it got going again! Plus digging the goo out of a blender is no fun. So, use a food processor! After all that, though, the crust was fairly crumbly even after letting it sit in the fridge for a bit. When I tried spreading the nut butter mix over it, it pulled away from the bottom of the pan. After freezing it, the chocolate turned out firmer than the crust making it hard to cut. BUT the filling and chocolate ganache are awesome. I would make again but may use some sort of shortbread cookie crust. These are INSANE. Like a Reeses cup but healthier. I made w/ peanut butter & LOVED these. Will try almond butter next time. Was wondering, I have blue agave already, and don’t really want to buy another syrup since I don’t use it very often. Do you think that would work as a sub for the maple, or do you think the flavors would contrast? I was wondering with these or any of the cheesecake recipes that involve freezing – I need to have them out of the fridge from 1-1.5 hours and then they can go back into the fridge. Would they melt and get ruined? AMAZING AMAZING! I just recently started following you and your recipes are out of this world! You make being vegan exciting again!!! Thanks for all the vegan friendly recipes!!! What kind of dates should I use? I prefer Medjool, but deglet nour also work. I ended up serving them without the crust layer and they were really tasty but still wish it worked out better! Hmm, it seems that with the almond butter layer you could just spread it with a knife and call it good if it’s sticking. I peeled my parchment paper off really quickly and that worked, but it could’ve been sticking if your almond butter was too runny (I get mine from the machine at Whole Foods so it’s a bit thicker than jar version). As for the crust, if it was falling apart I definitely recommend more dates! And in the future, you can make sure it’s sticky enough by scooping some out in your hands. If it rolls easily into a ball, you’re good. If it crumbles, add more dates! Glad you still enjoyed the flavors. Hope the technique works better next time! I have to be honest. I went to Whole Foods and I bought the almond butter in the jar. It was the natural kind and it had oil at the top and that created a nightmare. I contemplated making my own using the grinder. Now I wish I would have. Frankly this recipe didn’t turn out well. My dates, which I bought at Whole Foods, using the bulk foods dates – ended up being a challenge for me. The dates contained pits and I wasn’t aware that I needed unpitted dates. So I had to pull out the pits. Also they didn’t nice create little pieces like I expected. And it never balled up. It just stuck together in strands. Since the word dates and the quantity was all I had to go by I’m not sure what I might have done wrong. I didn’t know if I needed fresh dates, dates from a package that were already pitted – in other words the kind of dates weren’t clear. The base layer was dry and wouldn’t lay down right. I used the ingredients as suggested. I didn’t sub anything out. Then when I applied the middle layer – I had spooned it in – but it wouldn’t spread right. It just stuck to everything including my fingers. What a mess. Then I finally got it down and used the parchment paper and that created a humongous mess. I would recommend spraying the parchment with canola but I’m not sure it would have helped. The middle layer was just goopy. The only layer that reliably worked was the chocolate layer. Again I followed the instructions. I would suggest that “dates” or “chocolate pieces” aren’t very good descriptors. I ended up with pebble sized chocolate pieces – which was fine because it all melted nicely. I went out and bought an 8″ X 8″ pan at Target. They only had two and they were both glass. I expected to find an inexpensive metal one but none were to be had. I think the recipe would have been better if it were made for a 16 X 9 X 12 pan since this is a pretty standard size and most homes have that sized square pan. My bars came out with a chocolate solid layer and then pebbly everything else underneath. I’d say this is great for an almond ice cream topping or to mix with a nice no dairy option of some kind. It tastes delicious. I’ve been cooking non-vegan for about 35 years. Vegan about 10. I find vegan baking and even some of the vegan food (non-dessert) recipes to be really challenging. I try to use real, fresh, organic ingredients wherever I can and sometimes the results are just awful. Not trying to be a jerk here about this recipe. And it looks like many of you had great success but I sure didn’t. Made these today and they were delicious!! Very rich so I actually cut mine up into 15. I also subbed almond milk for coconut milk and worked fine. So great that you can freeze them too. Thank you! These are fantastic! 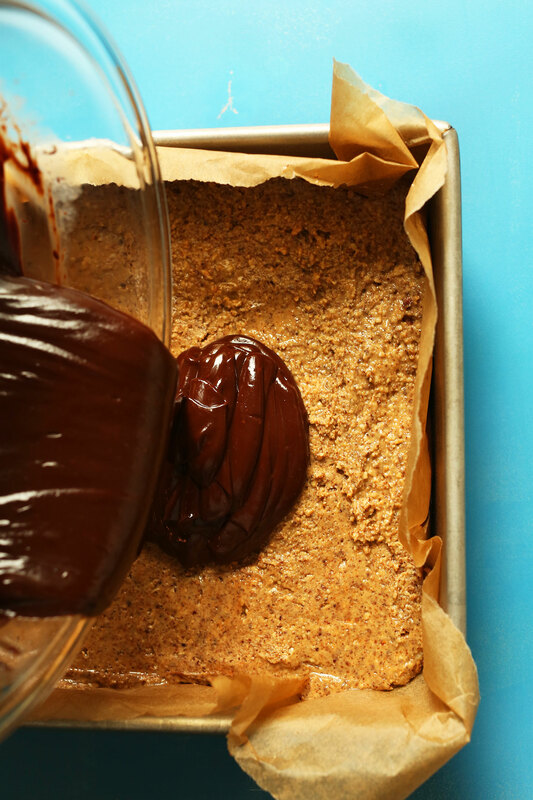 The chocolate is decadent and the almond butter and date crust are the perfect companion! A perfect treat to satisfy my cravings. The whole family loves them (much to my dismay!). Thank you for the great recipe! If I want to use peanut butter instead of almond butter and the peanut butter already has sugar and salt in it, should I omit the maple syrup and salt the middle layer calls for? Yea I think it’s a good idea to leave those out if you’re nut butter is already sweet and salty! I loved these!!! These are such a yummy treat and my whole family keeps stealing them out of the freezer! Thank you for posting this, they are lovely ! Your recipes look wonderful! I will be trying them out for sure! I am wondering what is the best substitute for coconut milk? I am not a fan of it. Would lactose free milk work? I just finished making these, and wow, they are incredible. I had to make a couple substitutions based on what I had (organic peanut butter instead of almond butter and almond milk instead of coconut milk) and even with that, they came out amazing. Only thing I might do next time is make it in a 9 x 13 pan. The bites came out pretty thick and they’re quite rich. I think if the layers were a little thinner it’d be the perfect little snack! I’d love to make these, but unfortunately I’ve run out of almonds and I don’t have any walnut :( Any substitutions? For the ganache, I don’t have any coconut milk or coconut oil, are there any substitutions for those? I don’t have dairy free butter or shortening, but I have lard, olive oil, canola oil, grapeseed oil and sunflower oil. Hmm those are a lot of substitutes and we can’t guarantee the results but check out our Recipe FAQ for ideas! These were wonderful! I brought them to a dinner we were having with another family and both couples and 5 kids all loved them. The texture and layers are just perfect. I added a little vanilla to the almond butter layer but I don’t even think it needed the extra flavor. I will definitely make these again. OMG! These are amazing, I just made them. Now, how would I go about not eating them all? Seriously, that’s my problem. Ha! Making them tomorrow and am already plotting how to get rid of 90% of them! These look awesome !! Can you please post recipe for iced oatmeal z bar? I actually have something similar here. They’re not vegan but I’m sure you could modify. Hope that helps! Can I substitute Almond butter with cookie butter? These are amazing!!! I made some today with peanut butter. YUMMM!!! Family of boys loved them , I didn’t have almond butter so used peanut butter, and no chocolate either ? Replace it with Nutella it was amazing !!!!! I made the ganache slightly differently: I started with 2-ingredient fudge frosting (semi-sweet chocolate chips + coconut cream) and just added a little coconut oil and agave. This is DEFINITELY one of the most decadent, healthy, AND easy desserts I’ve ever made (and I bake A LOT). I am saving this one for life. THANK YOU!!! Everybody loved them… they disappeared without a trace. These look delicious, but is there anything I can use instead of the almonds in the crust (gluten, oat and nut intolerant here)? colleagues at work. I switchef out the maple syrup for honey and used full fat coconut milk in place of the coconut oil and lite coconut milk combo. Turned out perfect. This gourmet recipe was so easy and quick! Thank you so much for your wonderful blog! I made these last night and the crust is really dry – when I spoon out a bar the entire crust falls away (still delicious). Tips? OK- you got me hooked. But my major issue is that I LOATHE coconut. Any recommendations for an equal alternative? Like almond milk instead of the coconut milk, and maybe another oil? Made this for my gluten free mom’s birthday — it was a hit! These are incredible for chocolate / nut butter lovers!! They’re a huge hit with everyone I’ve shared them with! These really look great! Got family coming into town this week. Going to try this out. These look amazing! I am always on the lookout for healthy and delicious dessert options, and these definitely make the list! Thanks for sharing the recipe. Very easy and delicious, my family loved it. but it wasn’t vegan? or it was horrible? or it fell apart? I do NOT like coconut oil, but I do have vegan butter! These were so good. I used old fashioned peanut butter because I didn’t have almond butter. Thanks for the recipe! 5 stars!!!! i’m with you!!! i DESPISE the taste of coconut. it would ruin the whole masterpiece. can we try almond milk?? maybe grape/avocado/canola oil instead also? i also have refined local coconut oil which i’m told takes away the coconut taste. I am addicted to those Hail Mary tarts so I made these this morning and with the exception of the crust they turned out great. It was still really crumbly and wouldn’t stick to the almond butter layer. I made them exactly according to instructions and I used 1 cup packed dates but I’m wondering do you think maybe I needed more dates? l love many of the recipes, thank you. This one, not so much. The almond layer I found too soft, the bottom layer not sticky enough and the chocolate is fine. I wish people would not write and even give stars! to a recipe not tried. I would not recommend this one. Others yes! Ok so I’m a little late to the party but holy crap these look good! Usually recipes for vegan goodies have so many steps and ingredients and overnight-soaking that they become intimidating, but these look so delicious AND easy! These have been pinned and are very high on my list of things to make. Hmm, dried prunes or cherries? But cherries might be overpowering. Is there another crust recipe you would recommend for this? You can try other crusts if you’d like. Maybe this one? I have not tried the Hail Merry tart, but at first glance, these reminded me of Eatin’ Alives’ PB Love Bar. Have you tried that yet? They are at New Seasons, People’s coop, and some farmer’s markets. They are one of the best things I have ever put in my mouth! I am excited to make these (maybe with peanut butter!) and eat the whole pan! I haven’t, but thanks for the tip! When you list Carbs is it Total carbs? Or is the sugar additional carbs? I made these yesterday!! I left them in the freezer a bit longer but OMG- they were delicious, cold and peanut buttery, not too sweet either! Im making your sundried tomato veggie burgers tonight! I just wanted to know – are chocolate chips really that healthy? Ive been on the hunt for less sweet chocolate chips- because let’s be honest, I am not doing with out them and I don’t have time to make my own. I have found Equal Exchange’s chocolate chips to be less sweet (and more conscious!) then other organic brands. Their semi-sweet chips are 70% chocolate! and Yummy. Dark Chocolate is nutrient dense, So the darker the chip, the more it can do for your body! An almond butter tart?? Well SIGN ME UP! These bars look amazing!! Any suggestions for almond butter brands? Can’t wait to try this! I get mine from the fresh grind machine at Whole Foods! Freshly ground is the best. Hi Dana- these look awesome. Would raw cacao powder work well in these as a substitute for the cocoa in the crust? These look to die for!!! 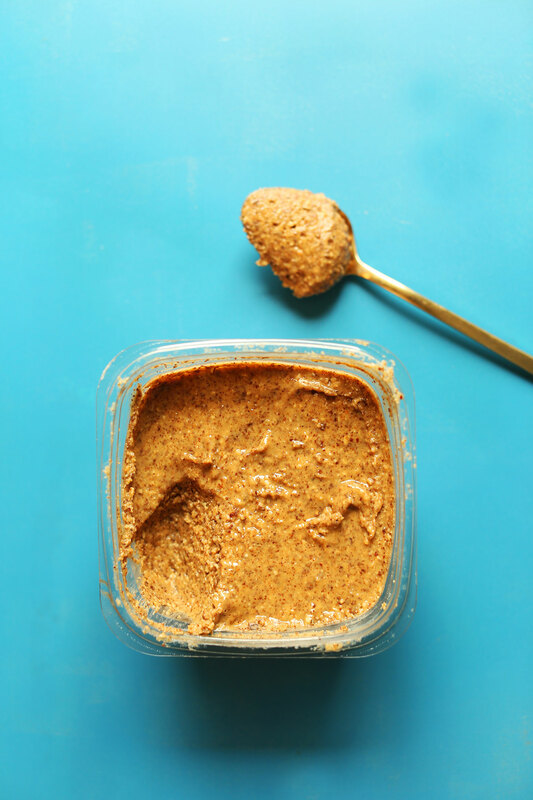 I’m always looking for more creative ways to eat almond butter than just with a spoon ;) Cant wait to try! I wish I had almonds now! These look absolutely incredible! Your recipes are a real inspiration to me and my food blog. Thank you for the amazing recipes! I will for sure try this one! These look delicious! If I use almond meal, how much should I use, roughly? Roughly 1-2 Tbsp! Or until it’s a spreadable thick frosting consistency. Hey Dana! Not sure why, but, ever since bloglovin “updated” it’s interface your photos have looked off. (pixelated, not up to their usual beautifulness) I just thought I’d give you a head’s up. Thanks for sharing! We’re looking into it! Dana, no-bake cakes is always my cup of tea and I always love to prepare them. 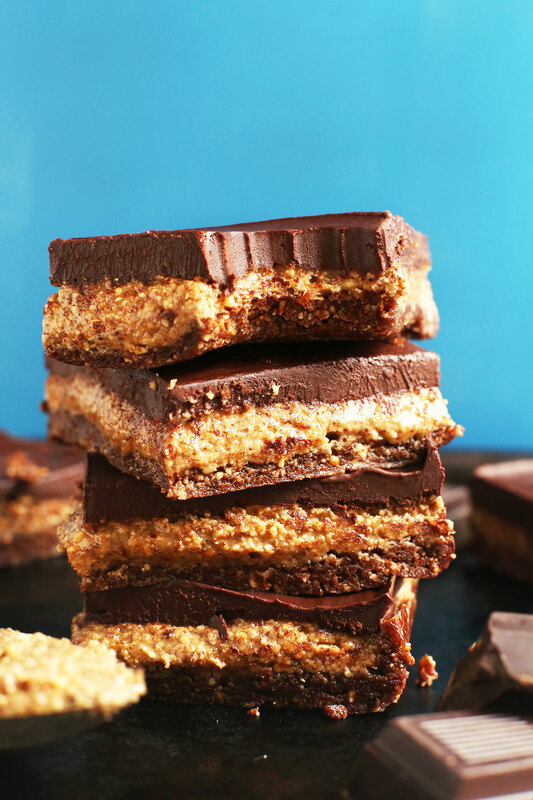 This ALMOND BUTTER CUP BARS is a must try. I will definitely try it out and share my experience with you. Thanks for sharing such a delicious recipe. Oh my gosh. Those Hail Mary tarts are crazy good! I haven’t had one for over a year…must try these bars! You are rocking it! Oh my gosh….made these over the weekend — crust was dry and crumbly probably due to dates being a little dry and warming them in water didn’t do much — but they were still good. Tried them again last night with fresh dates and they are over-the-top delicious!!! Definitely play with adding more dates if the crust isn’t pressing well. Also, I just added the dates this time in with the almond mix after it was crumbly and kept the food processor running as I dropped each one in…a bit easier. I cut these into smaller portions because they are so rich…but end up eating two at once anyway! These are seriously addicting! Nicely done Dana!! I should stop only drooling over these no-bake cakes and make them, because they look absolutely delicious!